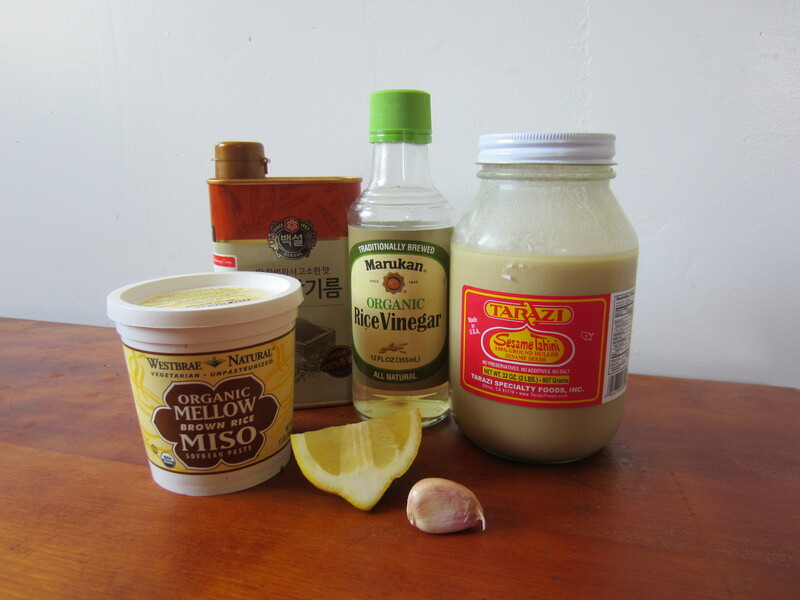 I developed this Miso-Tahini dressing a couple of months ago and it’s the gift that keeps on giving. It’s so simple, everyone is nuts about it, and it goes well with everything! I have dressed green salads with it, poured it on cooked legumes with rice….the applications are ENDLESS! I make it in a small mason jar, keep it in the fridge, and break into it all the time. Here, I’m making it for a dino kale salad with watermelon radishes! If you haven’t had watermelon radishes before, they can be mild or spicy, depending on the time of year. Not only are they tasty, these radishes add stunning color to any dish! 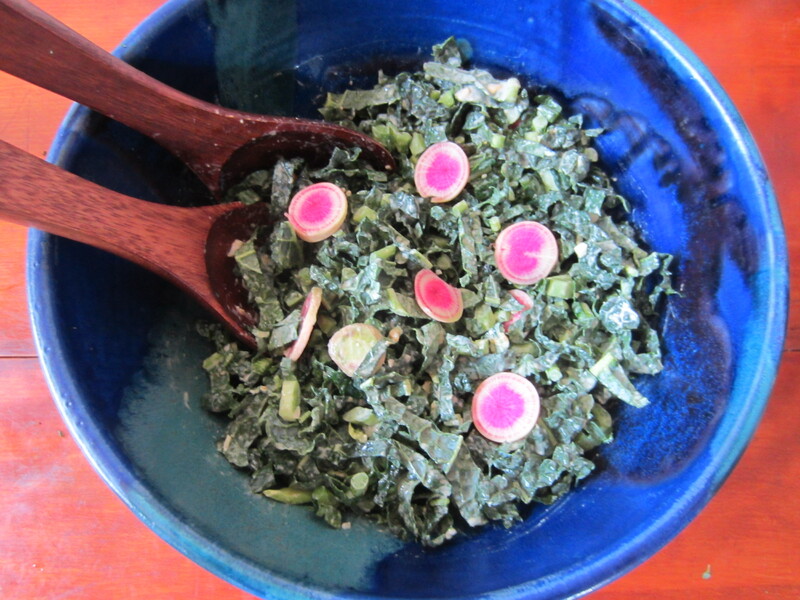 Wash your kale and bunch the leaves together to chiffonade them, meaning cut the leaves into long, thin strips. Some people like to strip the leaves from the stems, but I love including the whole thing. 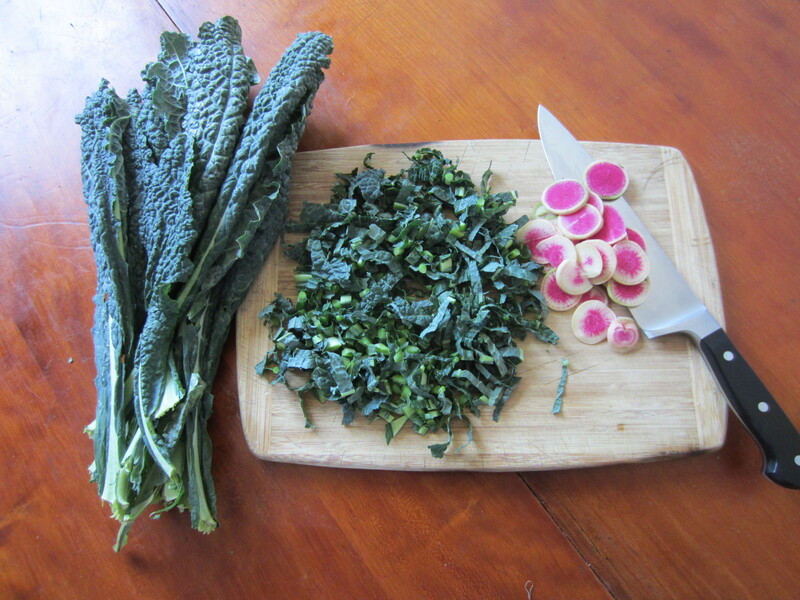 Slice your watermelon radishes into thin coins. 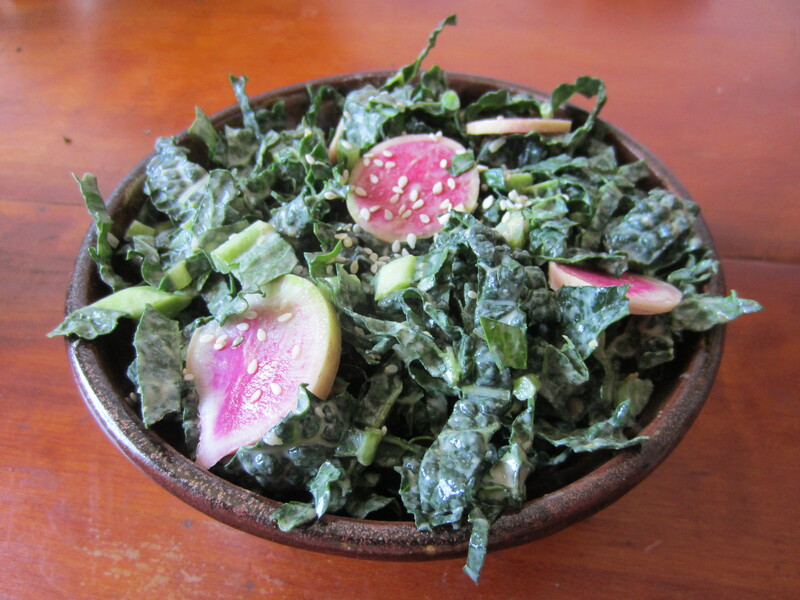 Toss your kale and radishes into a big bowl, awaiting the dressing of a lifetime. Grab a small mason jar, and throw in the minced garlic. Add the sesame oil, miso, tahini, rice vinegar, and then squeeze your quartered lemon into the mixture. Add pepper to taste. No salt needed with the miso we’ve added. Add 2 tablespoons of water, or more if you would like to thin out the dressing. Use a fork to blend all the ingredients together — the miso will be the most globby and difficult to incorporate– but it will mix in eventually. You can also put a top on the jar and shake it around. Spread it over your kale-radish mixture and toss liberally, covering the whole salad. If you’d like, spread some toasted or plain sesame seeds on top. Remember–this is just the beginning. Feel free to use this as inspiration to start planning what you will put this dressing on next!